One of the most cumbersome parts of running a silent auction is the bid sheet process. Bid sheets need to be clean and easy to use. Building a bid sheet is as personal as building an ice cream sundae. So many choices for ice cream, sauces, toppings, whip and a cherry too. Auction fundraisers have personal preferences to for bid sheets. Single, double, triple column; Bid increments bid pre-filled or blank. Will the bidder bid by name or number? Will email be required? AND bid sheets need to look professional and be consistent. You could spend hours creating excel or word documents for each and every auction item. If you have run an auction in the past you know that bid sheets is one of the biggest pain points. If you are considering this, heed the advice of 15,000 Auctria users and don’t waste the time on tedious bid sheet administration duties. 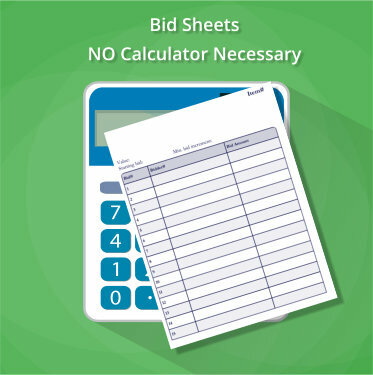 Work smart with automated and formatted bid sheets that are designed to match and brand your auction. If it’s blank bid sheets that you truly want here are few to choose from. If you want to create and modify your individual bid sheets create a Lite Account and try if for as long as you want. Load a few items then use the bid sheet portion of the program to print. Bid sheets are already formatted with lots of simple choices to make the bid sheet creation and printing process straightforward. Additional options are available to customize bid sheets with custom stationery adding any branding or text desired. Set bidding pricing so you don’t even have to use a calculator! Print one at a time, or a single sheet or all at once. Print just the Live, or Silent auction bid sheets. Print blanks to have on hand for last minute donations. Page size & layout can be used in standard mode with lots of options here too. 1-up, 2-up, letter size, half letter size. Set the print order too maximize efficiency. Adding this information provides instruction & more information. This means less questions during the silent auction. Apply global pricing policy and/or item pricing and never have to use a calculator again to determine auction item bid increments. You can apply a pricing policy to set the starting bid, minimum bid increment and 'buy it now' price for your auction items. Pricing auction items is not a perfect science, in fact, it can be quite tricky. Justify pricing by including numerous photos and lively descriptions. The key is finding the sweet spot that will initiate interest and bid donations to bring about the maximum potential, visibility and success for your auction. Remember, almost all auction items are donated, so any income is brought in is considered profit; fundamentally the higher the final bid the greater the philanthropy. Auctria makes the pricing process uncomplicated and orderly. Auctria provides options for pricing that are simple and flexible. Choose either a pre-programmed pricing policy OR individually price each item. Using a hybrid of both methods can cut work time too. Set the standard pricing structure and then go back and tweak the non-standard items. Apply global pricing policy and/or item pricing and never have to use a calculator again to determine auction item bid increments. Auctria is more than just pretty bid sheets and catalogs. Try out the entire Auctria program and maybe upgrade to streamline the entire auction process from first donation to last receipt. Auctria provides each auction event its own exclusive website. Use the website to create a professional and online presence prior to the event. Promote your auction to help with procurement. Showcase an online catalog for marketing, pre-bidding or a full online auction. Website templates make it straightforward to create an awesome looking website. Organize all operations with one program. Fundraising team uses Auctria for marketing. Procurement team loads all donors and donations. Finance team uses Auctria for collections and reporting. Additional revenue generators that are well paired with an auction fundraiser are: Run a raffle, Fund-a-Need, or Raise-the Paddle. Sometimes it's just a straight-up cash donation that bidders want to contribute to. Track all these transactions by bidder number, then closeout and run receipts with Auctria.